In honour of the festival of Purim, I have written an article for Jewish Eyes on the Arts - Oholiav, giving my top 10 masks of pop-culture (with my own kabbalistic interpretation). And there's nothing written after the jump, why would there be? In the world of Innistrad, a fantasy world created for the card game Magic: the Gathering, a godlike angel called Avacyn ruled the world, protecting the humans from the terrors that stalk in the night. In the archangel’s absence, the vampires, werewolves, zombies and geists grew in power, threatening to destroy the last remnants of the humans. While Avacyn eventually returned, being finally freed from her prison, her mask was a potent symbol of her power and her absence. 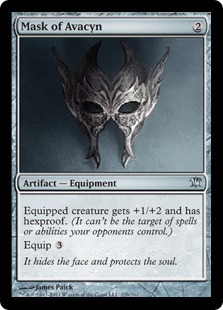 It hides and protects, but with Avacyn missing, it is a mask for no one, hiding nothing. Da’at (knowledge) is not a sefirah. In the space between Chessed and Binah there is only an absence, a reflection of Keter perhaps, or the power of the union of the higher sefirot. But like the Mask of Avacyn, Da’at is a powerful emptiness, the potentiality of space to work wonders, masking a God whose power cannot be observed but only felt. I know very little about comics or kabbalah (would quite like to know more about both, but aside from time concerns, both are just so BIG it's hard to know where to start, especially as they all seem to assume you know a lot already), so I can't really say much. So I'm just going to quote Arkham Asylum, where Black Mask suggests taking off the captive Batman's mask so they can see his real face and the Joker responds, "Oh, don't be so predictable, for Christ's sake! That is his real face!" Thanks for the thoughts - Rachel Dawes says a similar thing to Bruce Waymne in Batman Begins, that the Bruce identity is the mask, not the Batman. Hadn't considered Omega - maybe he earns a place on the list somewhere?